Minister of State for External Affairs and a member of Indian National Congress Parneet Kaur inaugurated the Art Exhibition titled as Life & Dance today at Lalit Kala Academy. 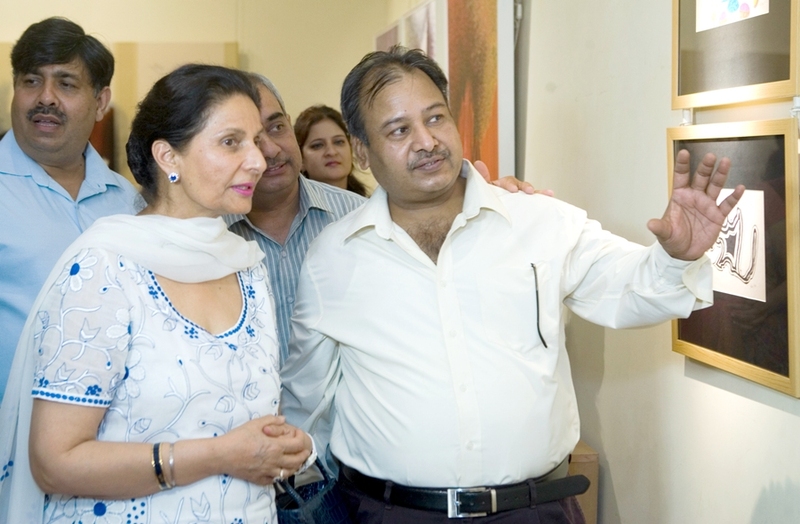 The exhibition is based on the lifetime experiences of Artist turned Additional District & Session Judge Virender Goyal. Many other known faces of the field of Art, Culture, writing and Judiciary was present at the occasion. After lighting of the lamps Madam Minister Praneet Kaur said that she is very much happy to inaugurate the amazing exhibition based on the different facets of life. “I was not aware about such artistic mind of Virender. I only considered him as a great poet and eminent writer, but now I have to set my mind again for adding this additional quality of this great human Virender, she said. S.K.Sarvariya, District & Sessions Judge, Delhi (North-West District), eminent writer Vijay Singal , worldly known lens-man Atul Bhardwaj, Pravasi Sansar fame Rakesh Pandey, Senior IPS officer turned photographer Somesh Goyal along with S.K. Jain, Additional District & Sessions Judge, Delhi, Shail Jain, Additional District & Sessions Judge, Delhi, Sanjeev Jain, Additional District & Sessions Judge, Delhi, Raj Kumar Chauhan, Additional District & Sessions Judge, Delhi, Barkha Gupta Additional District & Sessions Judge, Delhi, Nivedita Anil Sharma, Additional District & Sessions Judge, Delhi, were also present at the occasion.